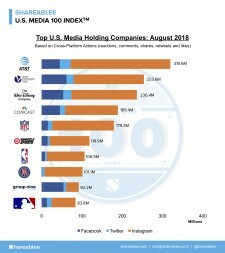 NEW YORK, September 11, 2018	(Newswire.com) - Shareablee Inc., the global leader in audience-based social media measurement, today released this year’s August U.S. Media 100 ranking of the most socially engaged media holding companies. The Shareablee U.S. Media Index represents a total of 3.6 billion cross-platform actions (post-level reactions, comments, shares, retweets and likes) for Facebook, Instagram, and Twitter. AT&T topped August’s list in engagement for the first time with 319.6 million cross-platform actions, after merging with Turner Broadcast. Twenty-First Century Fox ranked second with 253.6 million actions and Disney was third, with 236.4 million actions. 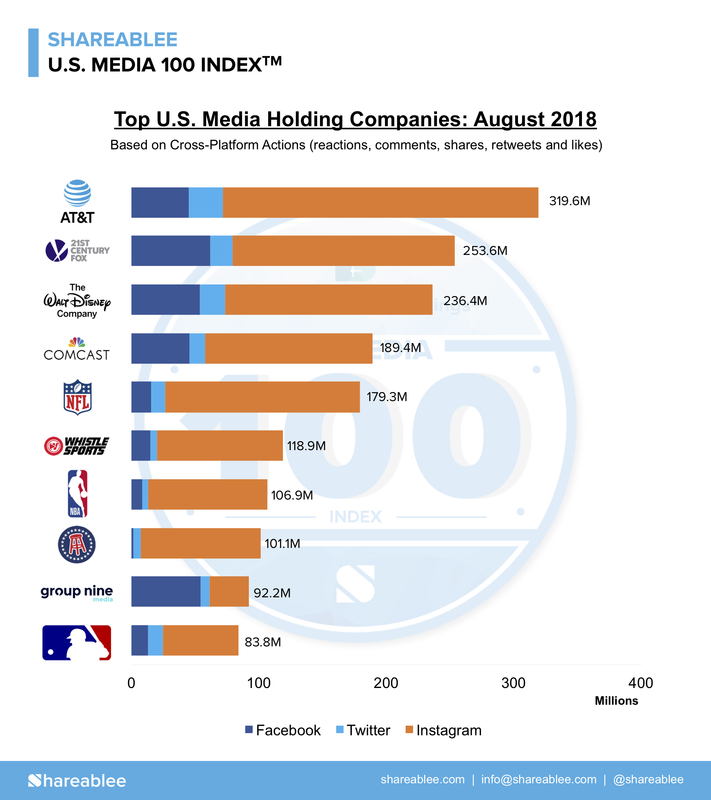 Comcast/NBCU ranked in fourth place with 189.4 million actions and the National Football League reappeared on August’s U.S. Media 100 this month in the fifth spot with 179.3 million total actions. Barstool Sports earned 176 percent growth in year-over-year engagement, with 101.1 million actions and 16 percent more cross-platform video posts since July. Group Nine Media led the category with 1.6 billion views, followed by Oath Inc. and Disney who each had 1.3 billion views. The top 5 most-engaged media companies accounted for 50 percent of all engagement across US Media during August. Comparatively, the top five spots accounted for just 11 percent of US media engagement in August of 2017. Launched in 2013, Shareablee Inc. is the leading authority on audience intelligence, competitive benchmarking and actionable insights for social media. The official social media analytics partner of comScore, Shareablee measures a census of global properties and collects brand audience and engagement data across Facebook, Twitter, Instagram, Google+, Tumblr and YouTube.